While it's not quite halfway through the season yet, we're going to take a look at the current state of the Mariners and what might happen going forward. Optimism has hit rock bottom, but the Mariners have found that the bottom isn't bad enough and are starting to dig to see how far down we can go before hitting the mantle and bursting into flames. There have been moves, non-moves, a dance, a jingle and other things that are slightly more entertaining on the field, like watching the groundskeepers mowing the grass. Justin Smoak, Mike Morse, Franklin Gutierrez and Kendrys Morales are hurt. Tom Wilhelmsen, Jeremy Bonderman, Aaron Harang and Joe Saunders visited a wizard, pissed him off and are now cursed with inconsistency. Jesus Montero, Dustin Ackley and Brandon Maurer faltered and have been sent back to Tacoma. These are just a few things, but major things. The commentary on the past is mostly a tongue-in-cheek thing, but I do believe that the future moves and non-moves mentioned is what will occur in the very near future. 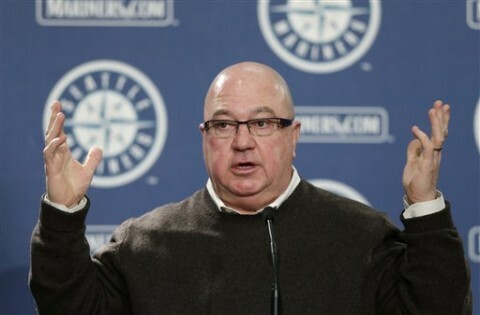 And now, the State of the Mariners Address. With the halfway point of the season fast approaching and no improvement in sight, we turn to the unproven rookies and veteran cast-offs to carry us through until the end. Bonderman has been effective in two of his three starts and, if his BABIP holds at .203 and his strand rate at 74.3%, can be an effective starter for the duration of the season. While his best seasons are probably behind him, we feel confident that, after his 8 inning shutout of the Houston Astros, we would be better served to keep him in the rotation and Erasmo Ramirez in the minors. Despite the effectiveness of Ramirez's rehab, we feel that he would be best served in the minors, getting more experience under his belt and letting the veterans we have hung our hats on do what they do best. Harang and Saunders have been inconsistent in their performances, but that should not quell your confidence in the front office and in the players themselves. They were added to the roster to help bolster the back end of the rotation and will iron out the kinks sooner rather than later, providing many more effective innings in the coming months. The injury bug has bitten the players, rendering them useless while they come back from their individual injuries. The injuries to these players could not have been predicted and is just one of the reasons why the offense has not been producing like we had thought before the season started. Gutierrez especially was expected to be an integral part of the lineup. Getting his injuries and physical issues taken care of and out of the way was essential and, after having accomplished that task, was expected to contribute on a regular basis without fear of injury. Our inability to foresee that Gutierrez would get hurt is in no way indicative of a blind spot or a flaw in the decision making process, but rather exposed us as positive thinkers and hopeful individuals while still being rooted in reality. The young core of our team has failed to come through and the front office has been the target for those failures. Let me be clear on one thing: The players themselves are responsible for their on-field performance. While it may be true that some philosophies, such as the lack of weight training, may play a factor, it is not the whole, but rather a piece, of the problem. Development of players and molding them into pillars of this franchise is difficult and is not always a guarantee. While I agree that the players have faltered thus far in their respective careers, never forget that there are mitigating factors, such as the case of Montero. We believed that he could become an average catcher and locked him into that position when he had yet to prove he could do it on a regular basis. His failure to perform is not the fault of management, but one of too much on a player's plate and not factoring in the fact he is not, surprisingly, a robot. If management can be blamed for anything, its that in this particular instance, optimism was too prevalent in the decision. After Jesus Sucre was injured, we believed that Brandon Bantz would be a more effective replacement over Mike Zunino. While that may have been questionable, we have remedied that and have placed Zunino on the club despite a .238 average in Tacoma. We felt that rushing him to the majors to lure fans to the ballpark and inject more passion into the fanbase was a more feasible option than possibly setting Zunino back in his development. The talent is there for Zunino to overcome any obstacle in his path and become a rookie of the year candidate by the end of the year. While some may find it objectionable that the call-up was premature, it was necessary to preserve the integrity of the roster and team as a whole. Josh Kinney has started his rehab assignment and will soon rejoin the Mariners to become part of the wonderful arms in the bullpen. Despite the effectiveness of some of our younger relievers, we feel that replacing one of them on the roster would send the wrong message to the other veterans on the ballclub. Kinney was an effective set-up man last season and, as Wedge has proven, playing the matchups is more important than giving these young kids a chance. Another right hander in the 'pen would provide Wedge with a more experienced reliever in the late innings and allow the younger guys in the 'pen get more work down in Tacoma. Nick Franklin has impressed in his stint in the majors so far this season and we feel that, to add to Ackley's workload in Tacoma, we'd have Ackley move to the outfield. With Gutierrez starting his second rehab assignment and getting back on the field soon, an everyday outfield of Gutierrez, Saunders and Ackley would benefit the ballclub. While it may take a while for Ackley and Gutierrez to join the Mariners from Tacoma, it will be worth the wait. Gutierrez will remain healthy throughout the season and provide an offensive punch at the top of the lineup, Ackley will have figured it out and give us excellent defense in the outfield and Saunders will break out of his slump while flying around the outfield like he has done so far this season. With the recent additions from the draft and a steady flow of young hitters and pitchers, we fell we're poised to make a run at the playoffs quite soon. I know it was expected that this would be another year of growth and understand the frustration, but like with any young talent, there come growing pains and bumps in the road. We're continuing down the right path and, in two years, we'll have a ballclub that will compete every season for the foreseeable future. There have been some bumps and bruises in this teen of a season, but we're confident that it will be turned around if not this year, then in the years to come. Your patience will be rewarded with a competitive club and provide you the opportunity to be a fan of these Mariners for years to come. If you still have reservations, watch this play by Brendan Ryan until you are satisfied.